Welcome to our Parish web site. Sunday mornings at 9 AM. Biblical Truth, Loving Community, Transformation and Joy! Welcome everyone to Easter Sunday! Coffee - You can find hot coffee in the Fellowship Hall prior to the service. Sunday School - No classes today. Youth Group - Will not meet today. Bible Study - Letter to the Romans resumes on Tuesday, April 22, 2019 at 6:30 pm. Holy Eucharist - Wednesday, April 24, 2019 at 11:30 am. Family Promise - Sue Comstock is looking for help for the upcoming events on April 28th and 29th. A signup sheet can be found on the drink table in the Fellowship Hall. We have access to a wonderful strawberry patch near Carthage (off 15-501). If you’d like to be notified of picking days, email judithedm@windstream.net to be added to the email notification list. We meet at St. Francis, sometimes on a weekday, sometimes on a Saturday and drive down together. One more copy of the book is still available for $12. At the event, we’ll linger over light, springtime brunch fare and then talk about what we’ve discovered in our reading. BRUNCH WILL BE PROVIDED BY THE WOMEN’S LEADERSHIP TEAM. Sign up sheet on the women’s bulletin board. IS SOMETHING HEAVY ON YOUR HEART? Instead of carrying a burden alone, consider filling out a blue prayer card (found in each pew) and placing it in one of the red boxes beside each entrance. A prayer team member will pray confidentially about each card during the coming week. Also just talk to any prayer team member (identified by red name badge), who will be happy to pray with you personally after the services. The San Damiano Cross is the cross which St. Francis of Assisi was praying when he is said to have received the commission from the Lord to rebuild the Church. It now hangs in the Basilica of Saint Clare in Assisi, Italy, Franciscans cherish this cross as the symbol of their mission from God. Please Pray for the concerns weighing on the hearts and minds of members of this congregation. If you need to add or remove a name from the prayer list contact Sue Comstock at 919-498-9154 or email her at suectrace@gmail.com. See current prayer list on last page of weekly parish bulletin. Names will be removed after three weeks unless you contact Sue to extend the time. EXPANDED PRAYER OPPORTUNITIES ON SUNDAY MORNINGS! 1) Trained members of the prayer team will be on hand to pray for you personally and confidentially for any need. Simply walk over to any prayer team member (identified by a red badge), and you will be joined by one or more other prayer team members, move to a quiet corner, and be prayed for. 2) Blue prayer request cards have been placed in all pew pockets if you would prefer to submit a request in writing. Just fill out a card and drop it in either of the two red boxes (one at the back of the church and one on the table beside the door to the fellowship hall). Prayer team members will pray for written requests during the subsequent week. Please be assured that all prayer requests are held in strictest confidence. Never consider a prayer need too small, too trivial…or too big! Prayer team members always begin by listening for God’s direction, and only then do they verbalize the prayers that they sense on God’s heart for you. Please take advantage of these new opportunities to receive God’s comfort and peace! St Francis Website - Be sure to check out and share our parish website http://stfrancisnc.org. Keep up to date our website is fully responsive on all formats: desktop, tablet and mobile phone for latest in weekly announcements, bulletins and events. Managed by Dr. Charles Wick. Thank you to those who have made reviews on our google listing, this helps our mission for reaching people on the World Wide Web and local areas. If you would like to contribute a review please search our name into google and you will see our google listing and you can leave a review and or star rating. Thank you for your united support. Visit our Parish Events Page for photos. See our new contact form below to keep informed and request parish information. St. Francis Anglican Parish Prayer List: Please pray with us! View our current bulletin for a detailed list. Pictures in Breeze - Please add a photo of yourself to your Breeze account. BREEZE Information (Our Parish Database) Please note we have added BREEZE link to our website menus for your convenience. * Questions: If you have questions about Breeze (or need to be added), please contact Brian Haynes at brianh72004@yahoo.com or (443) 326-8823. He also is happy to answer questions during the coffee hour after service. 2) use an existing photo and upload it for you (it can either be a printed photo or one you send him via email or text). Children have an opportunity to sing with Leslie after coffee hour meet in the choir room. 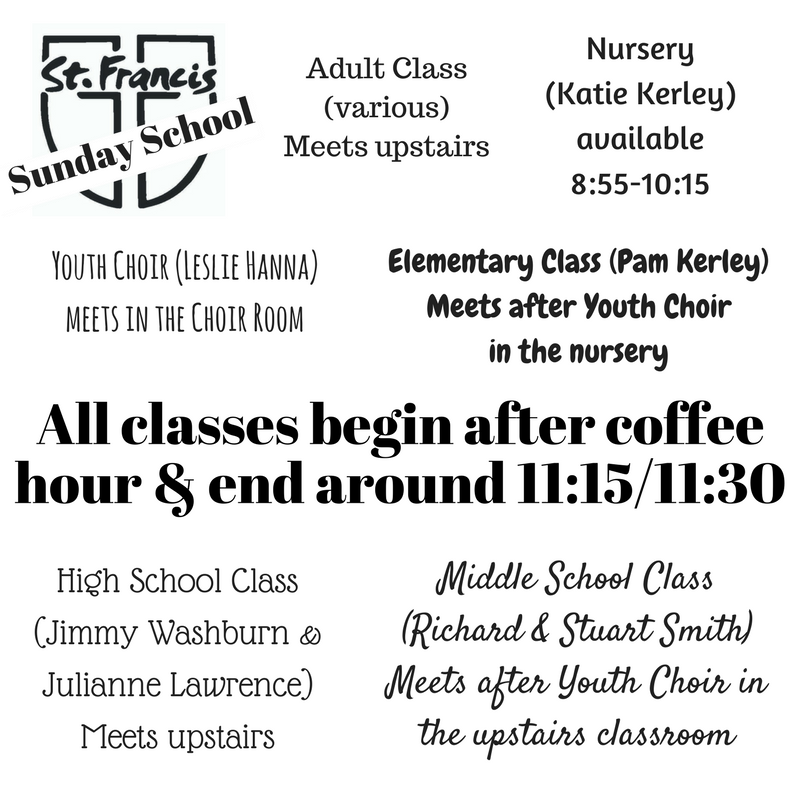 Elementary class meets after Youth Choir in the nursery. Middle school class meets in upstairs in classroom. High school class meets upstairs. Download 8.5x11 printable PDF for the kids or kids at heart. Enjoy, learn and share!